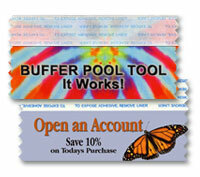 These, brilliant eye-catching full-color ribbons will tell your story and sell your product like never before. Using dye sublimation printing on white satin acetate ribbons captures all gradients, blends and photographic images in your design. PRODUCTION: 8 business days after proof approval. SET-UP FEE: $30.00, if you provide print-ready artwork that does not need additional preparation for production, this fee will be reduced to $15.00 after review by a designer. To order other sizes, please call. Please use this field to describe the design for your ribbon. If you have print-ready artwork or image files showing what you would like, please email them to sales@personalized-ribbons.com or upload a file below. These full-color ribbons come in two horizontal stock sizes and have dye sublimation printing on white satin acetate ribbons. Images and graphics may print to the edge (bleed). Each ribbon has an adhesive strip along the top edge and the ends are pinked to prevent fraying. Use these template instructions for designing your full-color ribbons. To qualify for the reduced set-up fee, follow the guides and instructions in the PDF file below. A designer will review the completed file and apply the discount if no additional design work is required for production. These templates have been optimized to open in Corel, Photoshop, Illustrator and as regular PDFs.